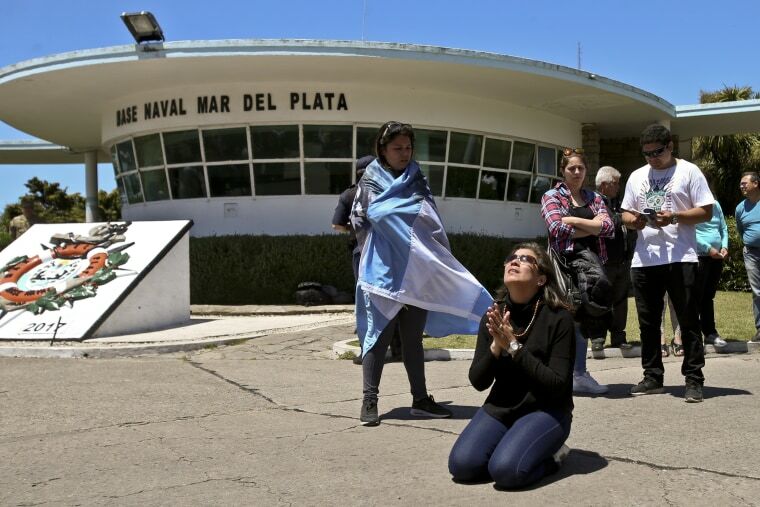 MAR DEL PLATA, Argentina — Argentina's navy insisted Saturday that a missing submarine had seemed to be in good condition when it set off on a training mission, despite fears it later exploded beneath the sea with 44 crew members aboard. "Two days before setting sail, there was a check of the whole operating system," navy spokesman Enrique Balbi said as a news conference on Saturday. "The submarine doesn't sail if that's not done. If it set off from Ushuaia, it was because it was in condition to do so." Hundreds of people from Mar del Plata gathered outside the naval base on Saturday to express solidarity with relatives of the crew, applauding them and shouting, "Be strong, we are with you." "We feel supported by the people," said Zulma de Vallejos, mother of crew member Celso Oscar Vallejos. "I know my son is going to return. I know that he will come back alive. The final word hasn't been spoken."